A Small Size, Well Made, Mississippian Faceless Hooded Human That Exhibits Surface Oxidation And Clay Coloration Aging Correct Surface Shell Grog Mixture, Aged Open Pit Firing And Fire Marking, Polished Neck Handle Wear, Correct Bottom Use Wear, Visible Inside Aging, Correct Material And Manufacture For The Area Found. Ex-Pat Orsary And Tom Davis Collections. Pictured In The Davis Artifact Relic List # 59 On Page 31. 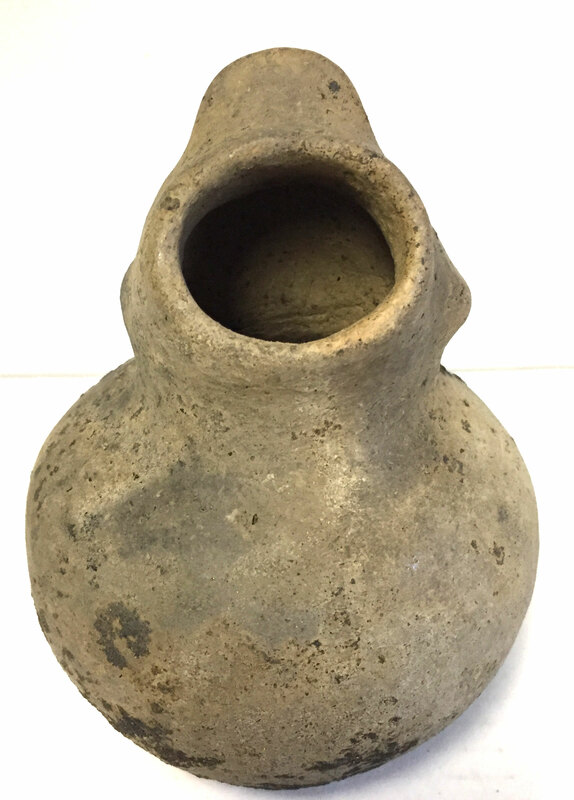 This Very Nice, Solid, Mississippian Faceless, Hooded Bottle Typically Displays The Top Of The Head, Ears And Hair Style, With The Bottle Opening In Lieu Of The Face. Includes A Ken Partain Certificate Of Authenticity.